Normally, I do not respond to triival controversies on issues that do not even remotely touch my life. However, this issue clearly touched everyone's lives, and so, here I am, taking a stance on it. Before that, however, let me take you through the entire controversy. 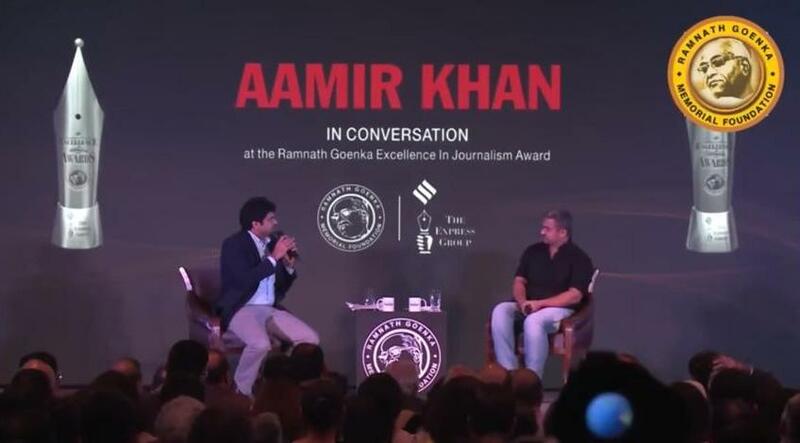 Aamir Khan's initial statement was made HERE at the Indian Express' Ramnath Goenka Excellence in Journalism Awards recently. Within hours, he was being attacked. Although he was purportedly quoting his wife KIRAN, he was being accused of being a seditionist! Thousands of messages across social media were painting him in black, asking for his head, asking him to leave India with his family, accusing him of being anti-national, of being a traitor and of false description of the state of India. Another video gave a more balanced view-point and gave an opportunity to Aamir to explain what he had said in the Goenka awards. However, the so-called Indian patriots continued to hoot and bray and shout against him. Then, someone had a "bright" idea to punish SNAPDEAL whose brand ambassador Aamir is. They uninstalled the app from their phones and exhorted others to do so as well. Within a few days, as per one news report this was being done with the hashtag "Appwapasi" and "SayNoToSnapdeal". In some reports, I gathered that more than 6.5 lakh people (650000) uninstalled this app and sent a message to Snapdeal via social media that they would not buy anything from them unless they removed Aamir Khan as their ambassador. The controversy raged on. On the one hand, there were open letters to him that ridiculed him and all the other "Khans", others that added a religious touch to it (equating the whole thing to Muslims feeling intolerant), and still others who created and circulated jokes on his supposed desire to leave India (there was even this image of Salman Khan escorting him on his back to Pakistan in a sort of Bajrangi Bhaijaan 2 - replacing the head of the girl with a photo of Aamir in an intelligently done Photoshop). One of those who joined the rabble rousers was Anupam Kher, whose saffron chaddi is always visible. Soon after, support for him surfaced - Rahul Gandhi, A R Rahman, and some others started the ball rolling, Soon, the intellectual class joined in and cleared the air, slowly but surely. He had never said anything anti-national. People who claimed they "tolerated" him because they went to his movies were exposed with the statement that they saw his movies not because he was a Muslim but because they liked his work. In the same way, their sails were knocked out when it was pointed out to them that they were, in fact, displaying the very same intolerance that Aamir had accused them of. If you analyse those criticising him you will find that none of those criticising him were Muslims, but many who started supporting him had Hindu names! The controversy is slowly moving from the front pages to the back-pages. When I searched for him on the Times of India website, I couldn't find anything for the last few days. I do hope that better sense prevails. It was sad that Aamir had to give out follow-up statements, but I am proud to report that he stood by what he had said and found no reason to change the statement. Also, he firmly said that he was an Indian citizen and was always going to stay so. This, then, was the way the controversy developed,. My own take: Ignore the rabble rousers. Aamir Khan's original video shows that he never meant to mix religion into the statement. He was merely talking about insecurities. Much like how parents feel insecure when their daughter returns late from a party. Or a wife, when her husband isn't home at the right time. Perhaps the last 7-8 months have seen some degree of individual remarks by people within the Saffron Parivar. Those statements should have been nipped in the bud by their mentors or organisations, or at least criticised by the PM. They weren't, but the anti-Muslim dialogue has taken wing and is growing more and more as the days pass. Hence, the kind of insecurity Aamri spoke about is quite natural to understand. What do you think? Join me in the comments section. a) I went with Nishrin, my better half, to Nanded on last Thursday and Friday, to visit all the important intra-city gurudwaras. b) From my return hour to Mumbai on Saturday morning, I straightaway boarded the car of my friend Dr. Vijay Chile, and joined him and three other class-mates (Suryakant Pol, Arun Sali and Mohan Kembhavi) on a 4-day trip to the Konkan strip south of Mumbai. Our destination was Ratnagiri, from where we travelled to Kudal and Devbagh, and did many interesting activities that made my weekend and the next few days memorable and enjoyable. c) Upon return from this unexpectedly enjoyable holiday, I visited the Visa Application Center of the UK Visas at Nariman Point and learned that my UK visa application had been successful, and that I could now plan my travel to the UK to join Blackpool Teaching Hospitals NHS Trust as a ST4 Paediatric Registrar. d) I began planning on what things I should buy and take with me, and what I shouldn't. In addition, I started planning how to call my close friends and home members for a small get-together to celebrate my success and to give them a great good-bye. One by one, the various plans are coming to fruition. On the other side, I am facing some health issues - nothing serious, though, and I am planning to tackle these as soon as possible, so that I have the fewest possible issues when I am in the UK.